Handle any impending home repairs in style with this set of bright, durable tools. Meet your new handyman, Roy G. Biv (AKA: you, using a rainbow tool set). Make Mr. or Mrs. Fix-it time a bit more fun with this set of durable essentials. 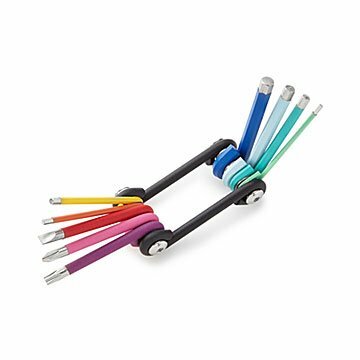 Bright colors ensure that the included allen keys, screwdriver, and slotted and torx drive bits won't get lost among the other odds and ends in your toolbox, and, of course, that you'll be able to handle any impending home repairs in style. Made in China. Son in law loved this gift. Love the colors. Love that you can carry in a purse. I wish it had an identifying guide for folks like me not used to handling their own minor fix-its. Perfect gift for my fix-it husband! Got this for my fix-it husband. He's got other multitools but this one is unique with its different hex and allen wrench bits. He was happy with the gift in his stocking on Christmas. Having this Rainbow Multy-Tool Set gives me a sense of comfort should I need to tackle a household problem. We bought this for Father's Day, and he really liked it. A well made tool in great bright colors that will be put to good use...and easy to find in the tool drawer! love this, bought one for my !